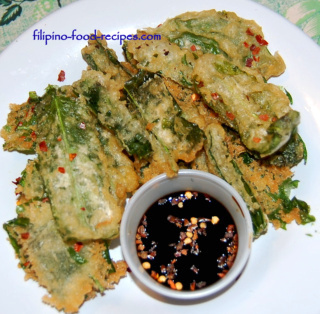 Crispy Kangkong are battered water spinach leaves usually served as appetizers. This kangkong recipe is very much like your typical vegetable tempura, where you coat the vegetable in a very light batter and deep fried until crisp and golden brown. The Kangkong gets to be crispy once fried and the texture is just like eating chips - kinda makes you forget you're eating a vegetable. The challenge, however, is in making the batter stick to the leaves. If you don't prep your leaves first, the coating will fall off the leaves once they are fried. The solution is to first dredge the leaves in cornstarch before dipping in the batter. Also, the batter has to be kept cold to keep the coating crunchy long after you're done frying. Season the fried Kangkong with pinch of salt and pepper right after you take it out of the frying pan so they are not bland and you can serve them even without a side sauce. 1 Mix together the batter ingredients and place inside the refrigerator while the Kangkong is being prepped. 2 Pat dry the separated Kangkong leaves, and dredge in cornstarch. Set aside. 3 Heat up the cooking oil using medium low heat. 4 Take out the batter mix from the ref and dip each Kangkong leaf, and drop one by one without crowding them in the oil. 5 Cook until golden brown about 1-2 minutes, or until golden brown, then set on a paper towel to drain excess oil. Sprinkle with salt and pepper. 6 Serve while hot with the dipping sauce. Remember to season with salt and pepper right after frying, just like how you would French fries. 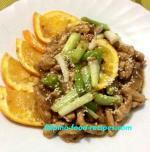 You could also sprinkle with garlic or onion powder and chili pepper if you want. Other alternative dips are mayonnaise mixed with ketchup, or honey and yellow mustard or serve with your favorite Ranch or Ceasar Salad dressing as dips. I like to fry Basil leaves with the Kangkong. Basil has a distinct taste that stands on its own even without a dip unlike the bland tasting Kangkong. Regular spinach are not a good substitute for the Crispy Kangkong because you need leaves that are paper thin to get a crispy texture when fried.